We took 2 points for the week which gives us 22.5 points which puts us in 5th place (Up from 8th). My Starting Average for the night was 138 and my handicap 62. I bowled a 154, 109, and a 174. Which makes my average 139 and Handicap 61. >I’m a week late in posting this I know I know give me a break! We took 1 point for the week which gave us 20.5 points which puts us in 8th place still. I bowled a 156, 121, and a 137. This week we played B-Unit. Once they update the website Tues or Weds Ill post the outcome. >I know I missed a week. 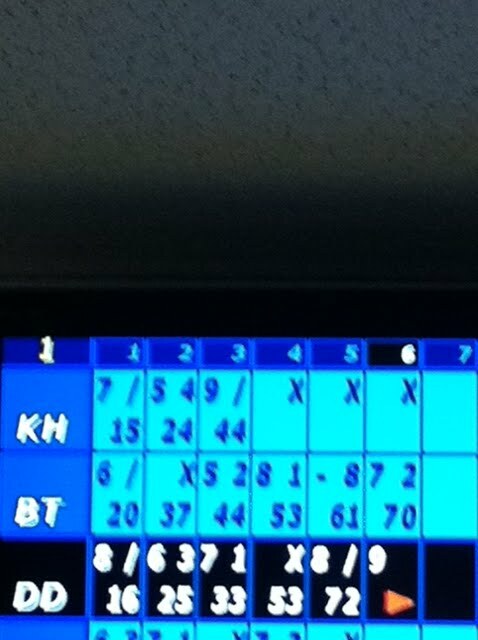 Week 9 I was still too tired and sore to bowl so I just went and cheered everyone else on. We ended Week 9 in 8th place. This week we played Pinned Down. We took 3 points for the week which gives us 19.5 points which puts us in 8th place still. I bowled a 162, 133, and a 128. >Well here is the update you have all been waiting for (well alright maybe not). Tuesday morning was a whirlwind of activity, We arrived at the hospital, and I wasn’t in the waiting room but about 10 minutes before they called me to go back to the surgery suite. At this point it was put this gown on, put your belongings in this bag and sit on this gurney. The nurse came around and asked all her questions, took my BP and Temp then left. Then the next person came in to ask some more questions and make sure I was doing ok. Here is my only complaint, when I spoke to the hospital pre-surgery they insisted I had to have an EKG, so 3 phone calls later it was settled I’d arrive early and they would do it then. Well guess who arrived early to find out no one knew a damn thing about it, so after much back and forth again, they did the EKG. Once all of that was complete they allowed the hubby to come back and wait with me. In the meantime it was me and crappy daytime TV. AUGH! It was Maury and the baby daddies, and Jerry with the 3somes with my sister. I settled on The Price is Right. So sometime around noon or so My Doctor, The Anesthesiologist and The Woman I learned who would be driving my gurney all came to visit. The hubby was teasing her and asked for her Gurney Drivers License cause of that one time I was in the Hospital for another surgery the girl hit every wall on the way to my room. She said “I’m a woman they revoked my Gurney License a long time ago”. The next thing I remember is them giving me a shot and starting to wheel me away, then when I start to come to there I am in recovery, with all their St Patricks Decorations. I will admit I was a very bit woozy at that point. The nice nurse brought me some ginger ale and walked me around, then they sent me on my way. It has been a tough few days but I do feel better. My biggest complaints are the constant dry mouth (especially after sleeping) and the fact I can’t breathe through my nose because of the Plastic Tubes up there keeping everything in place. I get the tubes removed on Monday and they say once that happens it will be so much better. Oh and food. I miss food. It’s been soft foods since Tuesday night. Protein Shakes, lots of liquids, eggs, and last night I graduated to lukewarm soup. So here I sit at home recovering. But avoiding the daytime tv.